EDITOR’S NOTE: U.S. Immigration and Customs Enforcement (ICE) and Homeland Security Investigations (HSI) are referenced in the story about purported “sovereign citizen” James T. McBride below. ICE/HSI also are involved in the investigation of the alleged TelexFree Ponzi- and pyramid scheme. Whether TelexFree had any “sovereign citizens” in its ranks is unclear. “Sovereign citizens,” however, have been linked to other HYIP schemes. Wild narratives may accompany such schemes both before and after a government intervention. James T. McBride first came to our attention in January 2013, after a reader alerted us to a story in the Sun Sentinel about a bizarre incident that occurred during a bankruptcy hearing for a Florida business known as RoboVault. McBride, who claims to derive his authority from the Vatican, sent letters to the judge and trustee demanding the bankruptcy case be dropped. He previously has been profiled in media accounts as a “sovereign separatist,” someone who believes he is not subject to state and federal laws. So-called “sovereign citizens” — jailed AdSurfDaily figure Kenneth Wayne Leaming is one of them — have an irrational belief that laws do not apply to them. Leaming became the target of an FBI investigation after filing false liens against various public officials involved in the ASD Ponzi case. Investigators found bogus police credentials in Leaming’s possession. By May 2014, prosecutors had formally connected McBride, 60, of Columbus, Ohio, to “Divine Province.” He has now been convicted in the Eastern District of Virginia on charges of conspiracy, causing the impersonation of a diplomat and producing false identification documents. Yes. You read that right: causing the impersonation of a diplomat. McBride was indicted on May 14, 2014, by a federal grand jury of one count of conspiracy, one count of causing the impersonation of a diplomat and four counts of producing false identification documents. According to the evidence at trial, McBride was the leader of a sovereign citizen group called “Divine Province,” whose members claimed the U.S. government was a “municipal corporation” that did not have authority over them. McBride produced and distributed false diplomatic identification cards to his group’s members, and he encouraged them to make claims of diplomatic immunity to avoid arrest, debts or taxes. None of the group’s members were in fact accredited diplomats. McBride started selling the identification cards in September 2012 at a seminar he organized in Herndon, Virginia. Afterwards, he started selling the IDs from a website and shipping them around the country. McBride sold the IDs in pairs, one that identified the holder as a “Universal Post Office Diplomat” and another that purported to be an “International Diplomatic Driver Permit,” for approximately $200. The defendant also encouraged his members to send copies of the IDs to governmental agencies to notify them of a member’s “status” as a diplomat. 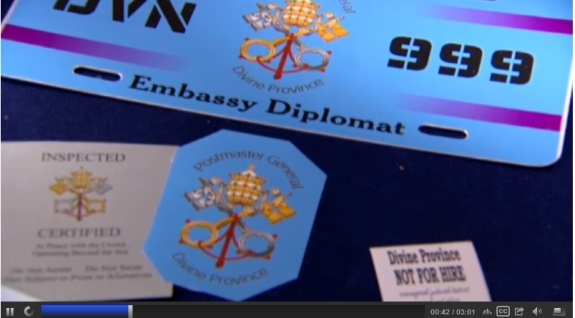 The defendant claimed that his authority to issue the IDs came from the Vatican. The defendant also gave a televised interview on ABC News prior to the filing of charges in the case, in which he reiterated such claims. During the course of the charged conduct, the defendant’s organization earned close to $500,000. McBride potentially faces two decades in prison, prosecutors said. don’t they have a bridge there for the tossing of things ??? No Son can ever START a Nation. The Nation exist already. Honor thy Mothers and Fathers by ‘name; and by principles.